Belize NMS: Generally fair weather today; moisture increases over the area tonight. 24-hour forecast: Sunny with cloudy spells today and cloudy skies tonight. Showers will be isolated, increasing tonight along the coast. Isolated thunderstorms are also possible. Today: Winds: East 10-20 kt. Seas: Moderate. ; waves: 4-7 ft.; only isolated showers. Tomorrow: Winds: East 5-15 kt. ; seas: Choppy-moderate. ; waves:3-5 ft.; a few showers; isolated thunderstorms possible. General Outlook: Friday night:- Winds: East 10-20 kt. ; seas: Moderate; waves: 4-6 ft.; a few showers (mainly south). 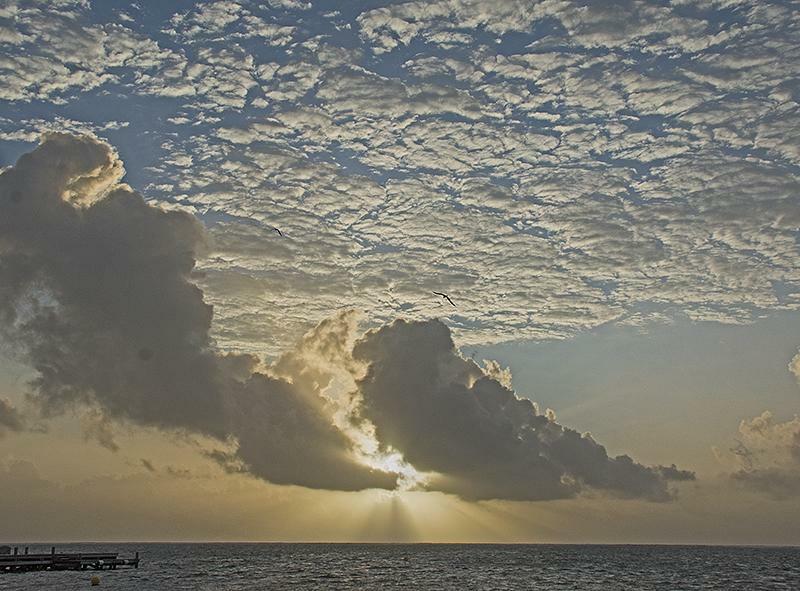 The beginning of a sunny day on Ambergris Caye with an expected high of 85 the wind is 13 mph. from the ESE. lookin good! The Caribbean winds from the east are predominating. But there is Pacific winds from the SSW that keeps interreacting with the lower level air and producing very significant clouds, some of which streamed over central and northern Belize last night but dried up now. I suspect it is this Pacific winds that are causing the mid level cloud over Honduras and Southern Belize right now. There is also activity to the west, over Mexico but that will have little effect on Belize. I expect today to be rather like yesterday, a fair bit of sun most of the day, with patches of cloud. 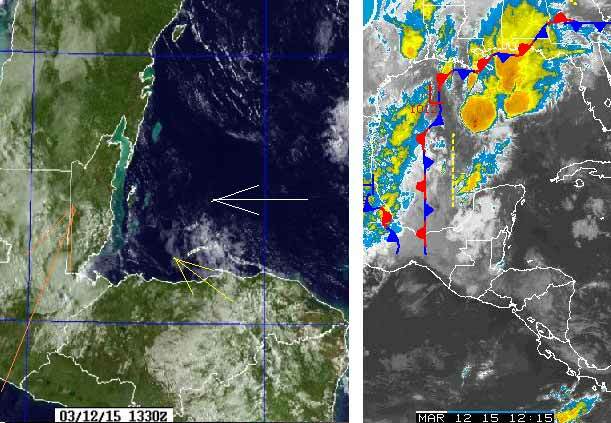 Initially mainly in the south, after the sort of fog as burnt off, but cloud patches later over most of Belize, I don`t see rain, yet some is forecasted for the north.